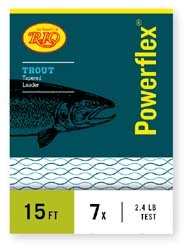 HOW DOES the 2012 product offering in fly fishing compare to years past? We could go with a 1-10 scale, with 0 being “the brand is resting on their laurels, go dust off your old gear and wait for something better to happen,” to 10 being, “this new stuff is so great you’d better grab the credit card before it’s out of stock.” But that wouldn’t help you discover if there’s a piece of gear coming down the pike that suites your personal fishing tastes. As fly fishers we enjoy an ever-rising tide of product that in many cases give us more performance than we need (witness reel drags and many rods). And high-end design tweaks show up in “budget” products faster than ever. So often it’s not about which product, but which of several products do we choose. With that in mind we put together the largest and most complete Gear Guide ever for 2012. There are more than 140 brands and 160 products mentioned in this year’s Guide. To make them easier to find, we’ve organized them by category (use the Jump To links above) and brand (use the brand links at page bottom). 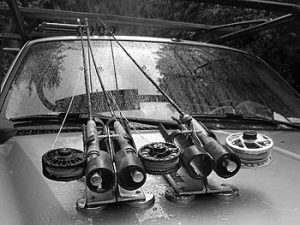 Are there some “game changers” that will affect the way we look at rods, reels, and the rest of the “arsenal?” Yes there are. Good, solid, functional products that will change the way many of us look at our tackle and approach the rivers and flats we fish are at hand. 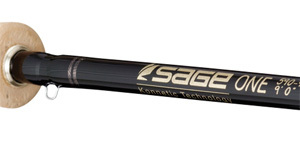 Fly rods get started with Sage introducing a “ONE” fly rod that uses new resin and graphite technologies, but not so much for the blanket “faster, further” hook that many rods tout in marketing-speak—rather, a focus on accuracy and precision. With ONE, Sage was actually a late entry in the new resin revolution, but the company really hit the mark with a rod that performs beyond its billing. Hardy has brought back the one-piece concept with aplomb in its new Zenith series, and on the other end of that equation Winston is weighing in with a souped-up 5-piece rod. Orvis has redesigned their popular Clearwater rods. Cabela’s is applying the newest “nano” technology for effect the its MTx series, Thomas & Thomas is back in the game with a classy, performance saltwater rod series, and Redington has three new rods sure to please the price-minded. 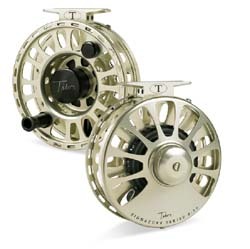 In fly reels, Tibor adds a new dimension to their popular Signature series with 11-12 versions for bigger fish. And Nautilus and Hatch Outdoors make an impression with smarter variations of existing concepts. Nautilus made a “Monster,” for big game fishing, and Hatch cut out the fat (meaning weight) for those who considered these impeccably-designed reels a tad on the heavy side. Bauer has combined the best attributes of its “MacKenzie” and “Rogue” series reels into a smart model, and Waterworks-Lamson has also shaved weight off its top-line reel, without compromising on drag performance. In waders, Simms is still producing high-end options, but the company has gone back to the pricepoint roots by offering new versions of “Freestone” stockingfoot and Guide waders; the “Freestone” uses Toray fabric, and as such costs $230. Patagonia has also waded in with “Rio Azul” waders that are light, packable, and cost $239. Patagonia and Korkers have also taken the “grip in the river” concern very seriously, vis a vis crampons and boots involving aluminum bar designs (Patagonia), and a new synthetic felt sole alternative (Svelte, by Korkers). 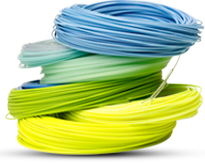 Fly lines are largely a subjective concern; they’re designed to fit specific interests and conditions. But the major players, like RIO, Scientific Anglers, Orvis, Royal Wulff, Echo and others have developed lines that match specific needs and interests. In other words, we’re seeing more specialized streamer lines, nymph lines, dry fly lines, and especially Spey lines. And if there’s a place where fly fishing brands display their creativity, it’s in apparel. Smart design is a part of Simms’s new jackets, shirts and sandals, and their ProDry jacket and bibs are a stylish choice for all types of fishing. Redington brings sonic-welded seams into a new jacket, and caught our eye with their technical Shuttle pants, and has plenty for women anglers to admire. Howler Brothers, Patagonia, and even Sage have new shirts and jackets worth taking a look at. 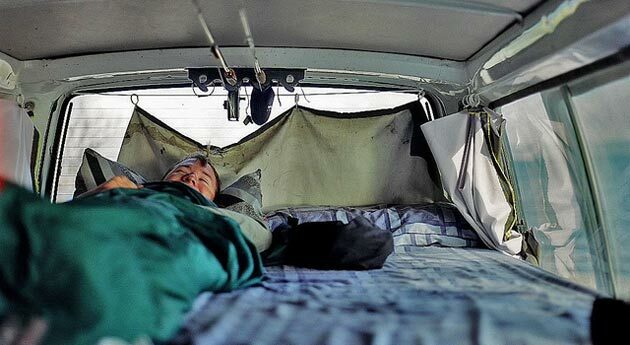 As for eyewear, accessories, vests & packs, leaders & tippet and all of that, well, those mostly fall into the “personal choice” realm, and there are plenty of new gizmos, slings, patterns, et. al. to grab the attention of fly angler consumers. Also new this year: more than 150 videos so you can actually get the product pitch straight from the people who sell the stuff. In many cases we’ve fished the products we wrote about, and if we have experience with the gear we’ll give you our honest opinion. Stay tuned as well as we add even more items to our 2012 Gear Guide in the weeks and months ahead.